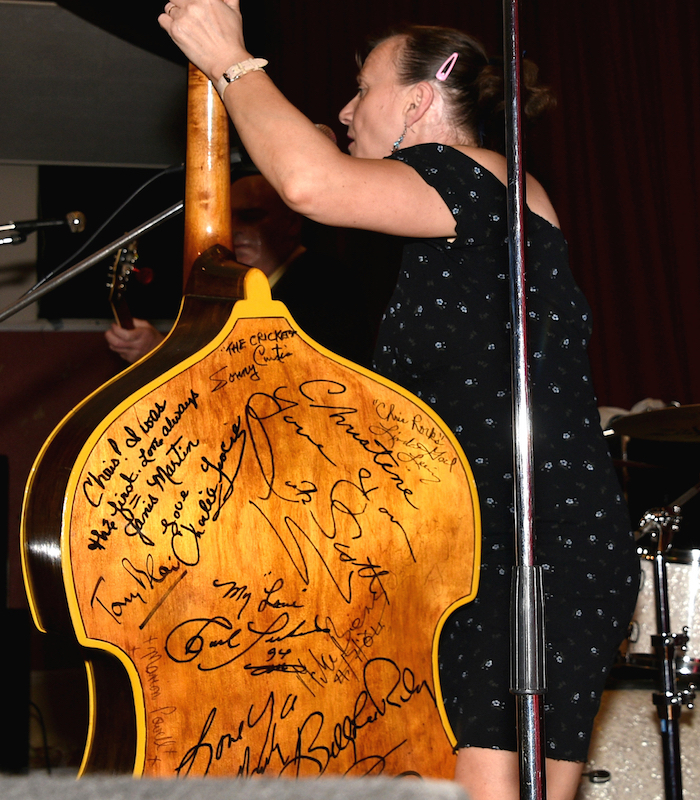 We don't think a gig goes by without, at least, one or two people asking about the names on the back of the bass, so we thought it would be nice to tell her story. There can't be many websites out there that have a full page of the website dedicated to an instrument, but Chris' bass is a very special bass or at least it is to us. It might not be worth a lot, in the fact that it's only a cheap bass, but it's worth a heck of a lot to us in sentimental value. Obviously, we played in the band for a long time before the boys joined and this bass serves as a living record of our time on the road. We travelled thousands of miles, all over the U.K and Europe and backed and worked with a lot of the Original 1950's American and British recording artists. This was an eclectic mix of everyone from the big, household-name, hit making stars, to the Rockabilly artists of the legendary Sun Record Label, to the "One-hit-wonders", right the way down to the plain, hard working musicians. Although not household names now, every single one is worthy of being regarded as a building brick for todays modern recording industry and certainly, deserve a mention here. Some became icons, some elevated to legendary, some faded into obscurity and some just carried on playing the same gigs that they'd done their whole lives - as with all musicians. 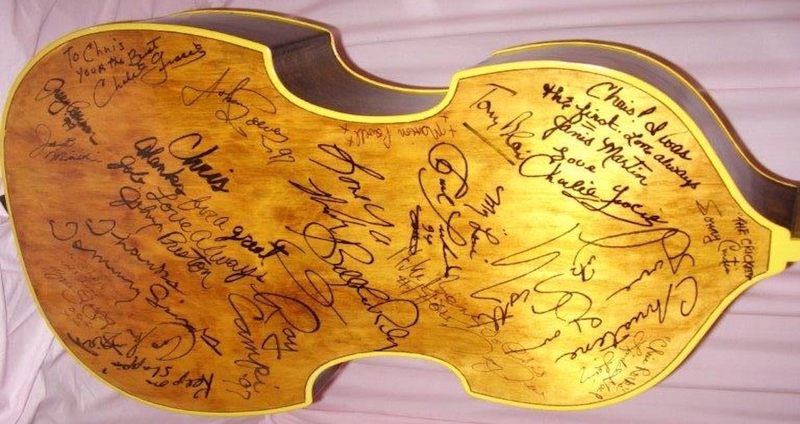 After a while we started to get a lot of these artists to sign the back of Chris' bass, so it's almost like a living autograph book! Our only regret is that we didn't think of it sooner as there are a lot of people missing, who we worked with and could've signed it! 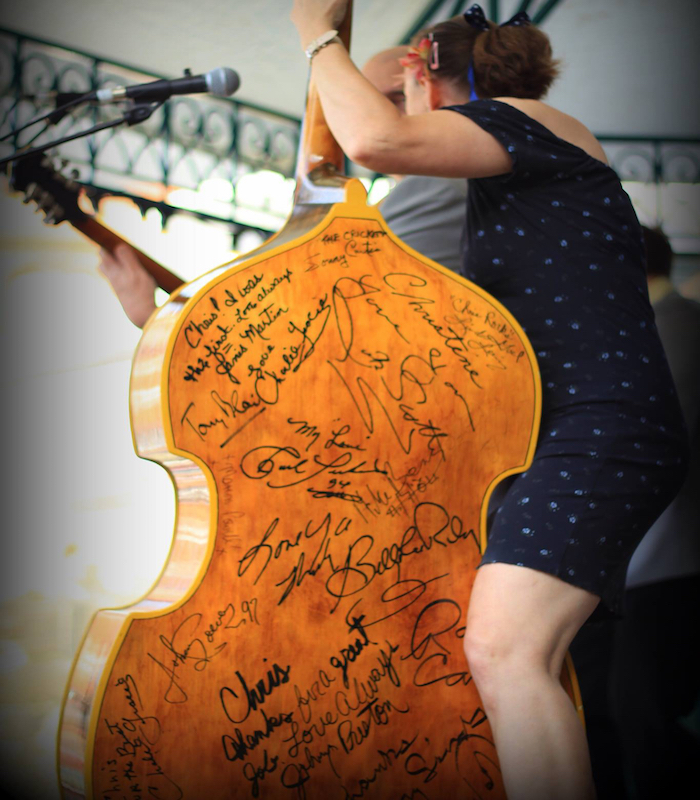 The first person to sign the bass was RCA Victor recording artist, Rockabilly Queen, Janis Martin - Chris' hero. Below is a list of all the people we've backed and worked with. The majority of which are, sadly, no longer with us. It's good to see the names written down because it isn't until we looked back that we realised just how many people we've worked with! Sometimes, when chatting in the house, we forget somebody until their name comes up! With today's technology, you can have some fun "Googling" some of the names - Even now we still can't believe it! The Comets, The Crickets, Carl Perkins, DJ Fontana, Jack Scott, Charlie Gracie, Janis Martin, Billy Lee Riley, Wanda Jackson, Johnny Preston, Frankie Ford, Sonny Burgess, Jackie Lee Cochran, Ray Campi, Tommy Sands, Linda Gail Lewis, Johnny Powers, Sleepy La Beef, Dale Hawkins, Ben Hewitt, "Big" Jay McNeely, Paul Burlison, Rocky Burnette, Frank Allen, Freddie "Fingers" Lee, Graham Fenton, Terry Dene, Lonnie Donnegan, Wee Willie Harris, Don Lang, Tommy Bruce, Chas McDevitt, Screaming Lord Such, Mike Berry. This was some party and certainly, a good apprenticeship!